The old saying, "feed a cold, but starve a fever" isn't true. Your body burns more calories when you have a fever, making your diet when sick essential to your recovery. If you don't eat enough nutrient-dense foods, you will lack the energy your immune system needs to kick whatever germ has you down. Get medical help immediately if you have a fever that is over 105 degrees Fahrenheit, that lasts longer than 48 to 72 hours or that is accompanied by a stiff neck, mental confusion, seizures, rashes or pain during urination. According to Vanderbilt School of Medicine physician William Schaffner, the best way to combat a fever is to consume plenty of fluids. There are a few great fluids to drink on the list of foods for fever, including water, hot tea, and 100 percent fruit juices. You should also eat fluid-rich foods for fever, like low-sodium vegetable or poultry broth, ice pops made from 100 percent fruit juice and thin soups. 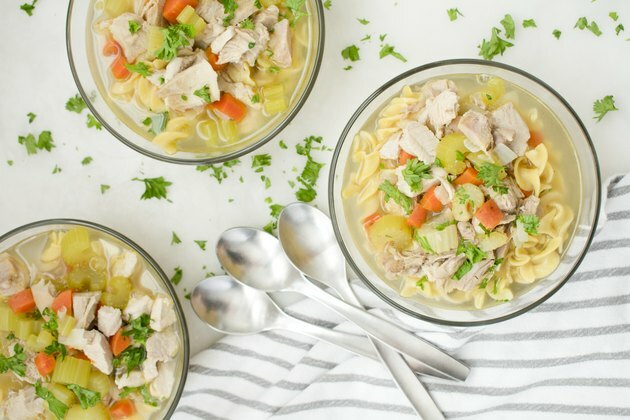 The vapor from hot foods like chicken soup can loosen dried mucus in your nasal passages and help relieve symptoms. Many fruits top the list of best foods for fever, including oranges, strawberries, watermelon, pineapple, kiwi and cantaloupe. These fruits are rich in vitamin C, an antioxidant that supports the health of your immune system. Bananas can help replace potassium lost to diarrhea, sweating or vomiting. Additionally, citrus fruits contain flavonoid compounds that decrease inflammation and boost immune cell functions. Pick fresh fruit instead of sweetened fruit products such as some brands of applesauce, fruit juice with added sugar or fruit canned in heavy syrup. Eating a high amount of sugar in your diet when sick may inhibit your immune system. An article published in Pediatrics in 2009 reported that regularly consuming probiotic foods, which contain beneficial live bacteria, could lower fevers in sick children. The children eating foods rich in probiotics were also less likely become ill. Yogurt that contains live bacteria cultures is one of the best foods for fever. To ensure that you purchase a brand with a high concentration of bacteria, look for one that has the "Live & Active Culture" seal of approval from the National Yogurt Association. Choose a low- or nonfat yogurt over whole-milk varieties to avoid saturated fat. Eating protein when you have a fever can help give your immune system the energy it needs to fight off infection, says dietitian Emily Cruwys. Choose small amounts of soft, bland foods such as scrambled eggs, scrambled silken tofu or poached, unseasoned skinless chicken or turkey. If you can't stomach solid foods, get your protein boost from a high-protein shake, a smoothie made with low- or nonfat milk, yogurt or tofu, or milk added to hot tea or coffee. Focus on getting enough calories in your diet when sick to heal your body and restore health. Getting enough calories isn't always an easy task. Try eating anytime you're hungry, not just at mealtimes. This might mean that you eat five or six small meals throughout the day. If you're laid up in bed, keep a few of the best foods for fever stashed next to your bed to increase your caloric intake. While fluids are essential, be sure to not fill up on them before mealtime. If you're feeling up to it and your doctor approves, try a glass of beer or wine, which are both proven to stimulate your appetite. If you're too sick to prepare your meals, ask for help from family or friends. Adding in a few of the best food for fever and utilizing these strategies can give you the energy, calories and nutrients you need to get you back on your feet in no time.